Failures of steel parts in service or production occur very infrequently. However, when steel parts fail, the consequences are dire. Quench crack- this is not good! Here are 7 ways that steel can fail as a result of Quench Cracking from heat treatment. Overheating during the austenitizing portion of the heat treatment cycle can coarsen normally fine grained steels. coarse grained steels increase hardening depth and are more prone to quench cracking than fine grain steels. Avoid over heating and overly long dwell times while austenitizing. Improper quenchant. Yes, water, brine, or caustic will get the steel “harder.” If the steel is an oil hardening steel, the use of these overly aggressive quenchants will lead to cracking. Improper selection of steel for the process. Too much time between the quenching and the tempering of the heat treated parts. A common misconception is that quench cracks can occur only while the piece is being quenched. This is not true. If the work is not tempered right away, quench cracks can (and will) occur. Improper design– Sharp changes of section, lack of radii, holes, sharp keyways, unbalanced sectional mass, and other stress risers. Improper entry of the part/ delivery of the quenchant to the part. Differences in cooling rates can be created, for example, if parts are massed together in a basket resulting in the parts along the edges cooling faster than those in the mass in the center. Part geometry can also interfere with quenchant delivery and effectiveness, especially on induction lines. Failure to take sufficient stock removal from the original part during machining. This can leave remnants of seams or other surface imperfections which can act as a nucleation site for a quench crack. Finally, materials that are heat treated to very high strength levels, even though they did not quench crack, may contain localized concentrations of high residual stresses. If these stresses are acting in the same direction as the load applied in service, an instantaneous failure can occur. This will be virtually indistinguishable from a quench crack during an examination, due to its brittle failure mode, lack of decarburization on surface of the fracture, or other forensic evidence of a process failure. When looking at quench cracking failures under the microscope, cracks and crack tributaries that follow the prior austenitic grain boundaries are a pretty good clue that grain coarsening and or its causes- overheating or too long time at temperature- occurred. 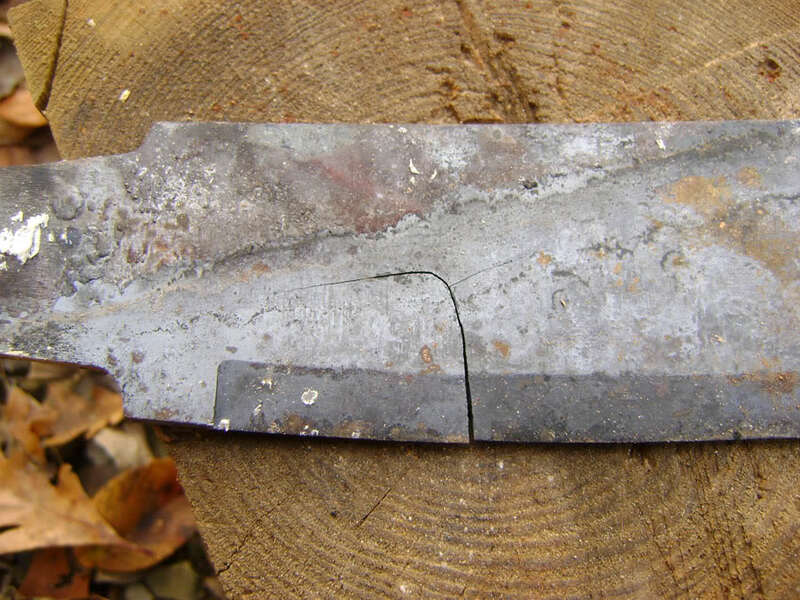 Temper scale on the fracture surface helps the metallurgist know that the crack was present before tempering. Decarburization may show that the crack was open prior to quenching. Photo1 Thanks to WIP SAMI over at British Blades for the photo. This entry was posted on Tuesday, August 3rd, 2010 at 4:15 am and is filed under Engineering, Shop Floor. You can follow any responses to this entry through the RSS 2.0 feed. You can leave a response, or trackback from your own site. Milo, I have linked to this article from my armour making blog site. FYI. Thank you for the great articles! Thank you for the link and support. EN 8 is nominal equivalent of US grade 1040. You do not specify the diameter of the bar, the depth of the hardness, nor the quenchant. you do not provide the frequency, depth, or time.involved. You do not specify if there is a temper cycle after quenching. You do not specify if the cracks are longitudinal, or transverse. It is possible that the cracking is being initiated on a prior existing seam, you do not inform us if the bars are black (as rolled) or Have had stock removal taken prior to induction process. Have you done any metallography on the cracks? what do you see? any evidence of decarburization? Scale? Failure analysis is a matter of asking the appropriate questions that identify which of the precondiditions for the failure were present, and eliminating as probable cause those that were not. Section changes are often the location for quench cracking. Had similar problem cracks in the induction hardening of crank pins of crankshaft which was due to higher range of hardenability in the steel used. This was resolved by reducing the severity of quenching by increasing the concentration of polymer quenchant. Sir, I work in JSW steel ltd., can u please end me more information about surface defects of CRCA, HRPO and HRSPO. Their causes and their identity? I would be really grateful. Hellow i`m south korean university student. how can metal crack reduce?? The link below shows cracking in the inside corner of a shelf projrction of a massive steel anvil casting. The anvil is of German manufacture and is generally considered to be a top of the line product with working surfaces hardened to rockwell 59 hardness to a depth of 1inch. My question is can these cracks be expected to continue to propogate through the casting body or will they be likely to be contained/stopped by the underlying unhardened body of the anvil casting. Can other effects of these cracks be predicted ? Cracks will continue to grow until all stresses are equalized. And with repeated cyclic heating and working, It is not even worth trying to repair by welding. I am steel plant manager in KSA. I have longitudinal cracks in 16 mm reinforcement bar.